A new version has been released which has this issue fixed, please update plugin on your site. Hi, thank you! But in the admin panel of my website i can see the plugin but don’t appear the icon for the updating. Can you send me the new version? 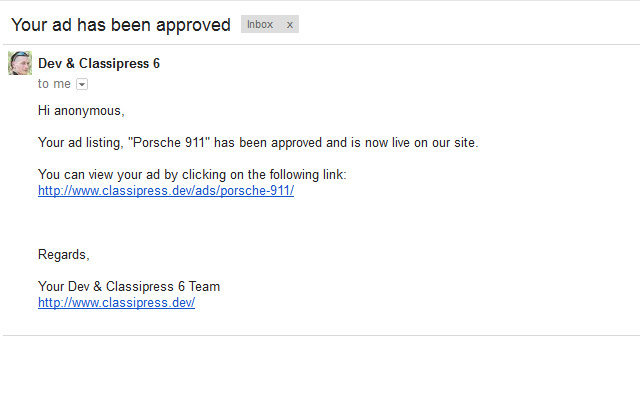 you can make an announcement including making a false, E-mail, and the ad is inserted without problems. 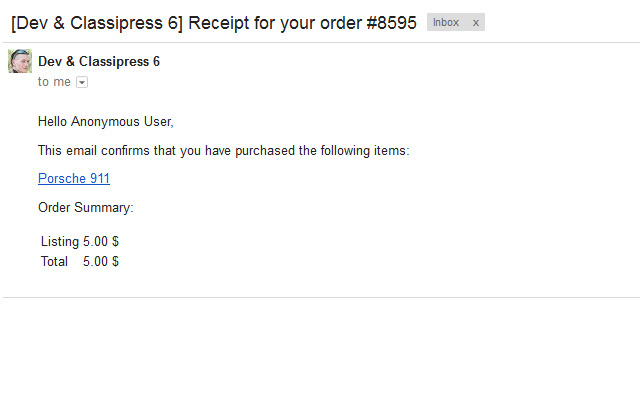 everything will have to be confirmed (by clicking inside the ink confirmation) in the e mail address. That comes at entered during ad placement. si può fare un annuncio anche mettendo una falsa,E-mail, e l’annuncio viene inserito senza problemi. Come per la registrazione utente. il tutto dovrà essere confermato (ciccando dentro al ink di conferma ) contenuto nella e mail. Che arriva all’indirizzo inserito in fase inserimento annuncio. Please note that ClassiPress has built-in moderation feature. Please enable it to review each Ad posted by users. Thanks for reporting! I’ll update plugin shortly, to support new reCaptcha added in the latest ClassiPress 3.5.2 release. Please go to your user dashboard, download new (1.6) version, and update it on your site. Hi meloniq, Currently this is working fine. But i suggestion can u add this features ? 1) This woks 1 single user account “Anonymous ” user. All ads posted this account only. unexpected Anonymous lost account. Eg. : One user First time posted his ads Anonymous account. After how to change general account ? this feature is not available in this plugin. So i am a site owner i lost 1 user account. Please add Username & Email mandatory. With using email, username when user post new ad automatically create new user account. Then also ads live. 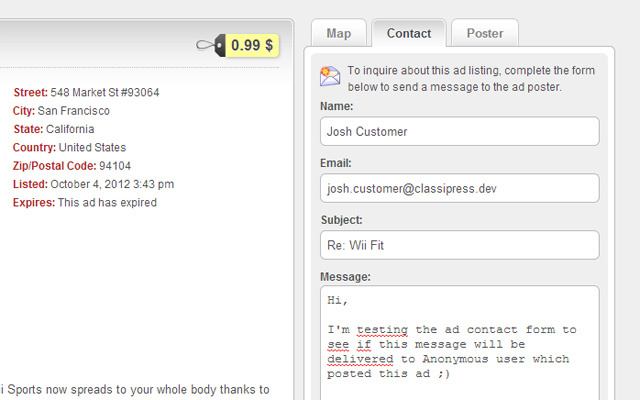 Anonymous plugin just usages without registration ad posting this is useful. Then Every user automatically created different accounts. With using Email & User name based personal account. My Problem is i recently using classionline plugin installed. 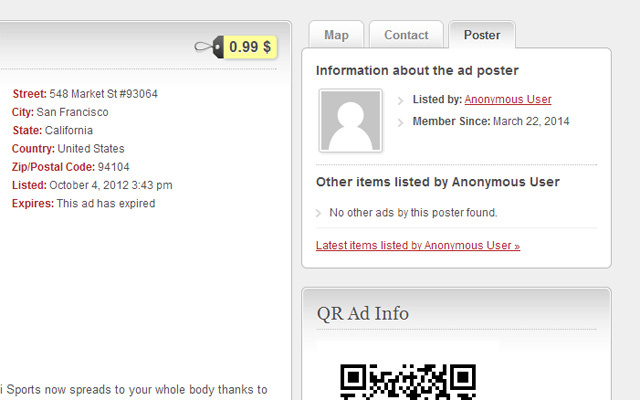 Then any 1 single user Anonymous posting time All Anonymous ads showing online blinking. But there is 1 user online not all ? this is main pont. So Please can u update Next Asap very important & useful all classipress users. I have used others classifieds websites works posting time username & email based account automatically created after adposting. then successfully ad post & account creation at one time. I would like to buy this plugin. I have one question before. It’s important for me to show user before choose posting ads as Anonymous that later he will have no feature like renew ads or more feature like registered account. Is it possible to do with this plugin? If not Is it hart to add feature like this to this plugin? Yes, that splash screen is possible to add (please note this feature is not planned for plugin), probably the easiest would be to use additional cookie to recognize if it was already shown to the user, the hardest part probably is creating a page (or popup) with side by side compare, where are pointed all benefits and disadvantages. P.S. Edit, Delete, and Renew actions are available for ads that has been created from anonymous account – user just have to use unique URLs that has been sent to him in email. So it’s not possible with current version of this plugin and it’s not planned. It’s a pity. My goal is to have as much as possible registered users, in the last resort let them post as Anonymous. hi.i bought your plugin but i have an issue. whenever i try to post an ad,it doesnt go to next step when i click the button. 1. Why is an email field put in the create ad page and is obligatory- as often they may not have an email address (instead a mobile phone number)- can that field be made as optional (and how, if so)? 2. Can the text ‘Email Address’ be changed to other language- as rest of site is in pt_BR but this string shows up in English- the ClassiPress and WP lang packs do not catch that text? 1. Can I make anonymous user or anonymous user 1, anonymous user 2, anonymous user 3 and so on, to avoid all the ads from all anonymous user . 2. How and where to rename or translate the anonymous user in Russian, I translated everything but anonymous user is not translated and is displayed always in English. Thank you! re.1. No, this plugin works with single Anonymous account. re.2. Please go to “wp-admin” area, “Users” page, find Anonymous user, and edit his name. I’ve just bought this pluging and i would like to know how i have to proceed to translate from english to french for example? Which file i have to modified. In the ‘languages’ subdirectory inside of the plugin you will find file ‘appthemes-anonymous-posting.pot’, in case of French, please rename it to ‘appthemes-anonymous-posting-fr_FR.po’ and translate it using the PoEdit editor. ok, thank you. It’s ok now. Sorry, i’ve just noticed a problem and hope there is a solution. With this plugin, if there are 2 (or more) different users which they enter ads..and if i click of one of their ads and go on the right sidbar at ‘Poster’ to get information about this user, i see all the ads of the differents users (and not the only ads of this specific user). Is it possible for guest user to post AD from front end and after AD submit admin will approve this AD then it will be displayed in front end.???? 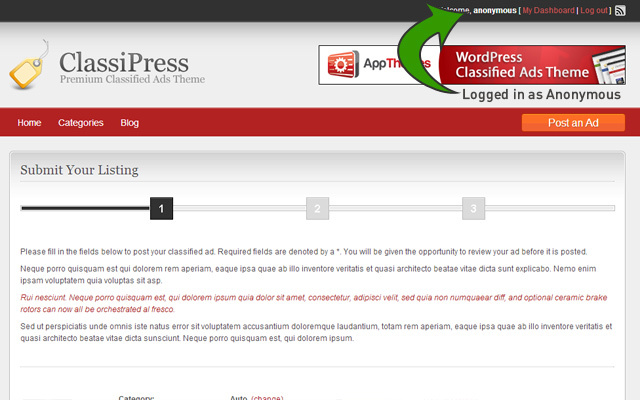 Yes, that’s the intention of this plugin, to allow guests posting an ads without having account on your website. 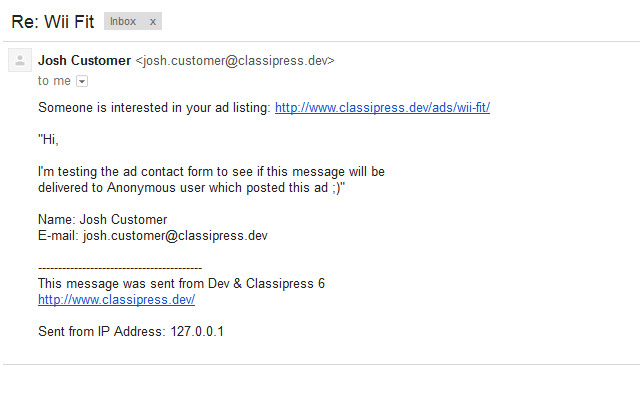 If you have the option “Moderate Ads” enabled (ClassiPress –> Settings –> Listings tab), then all ads will need to be approved by the administrator before publishing. Currently, whenever someone wants to publish an ad, they are asked to log in first (if not already logged in). The plugin allows the user to enter the details of the ad first and only when he tries to publish the ad at the last step he / she is asked to register (email + password ). 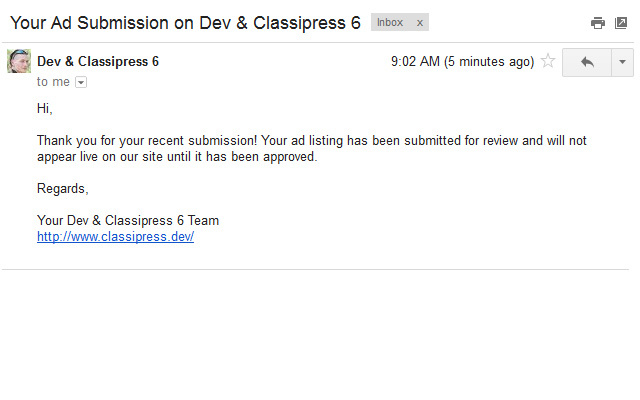 The plugin is up to date with the latest version of wordpress and classipress? this plugin is compatible with the latest versions of WordPress 4.9.1 and ClassiPress 3.6.1 ? I also wanted to ask if there is a demo of the plugin (or an example site of someone who bought it) to see it running.